We're based in London, England. location inside or outside the UK. I can also do other cameras on request. Editing on Adobe Premier Elements and Final Cut Pro X. To Book a Course Phone Christina Fox: 020 8621 3649 (international: +44 20 8621 3649). If you can't see what you want, we'll design something just right for you. The C300 was the most hired camera in 2014 and 2015. 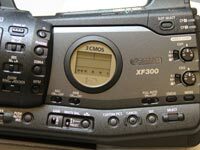 Broadcast Self-Shooters job adverts asked for C300 experience more than any other camera. I have a C300 and can give you a whole days hands on training to ensure you feel confident with the camera when applying for jobs or before the next shoot. One-to-one camera training is all about getting exactly the training you need. No sitting in a crowded classroom wishing the instructor would speed up or slow down. You don't pay to learn stuff you already know. You won't feel embarrassed about asking questions in front of others. All one-to-one training is tailored to suit your needs. You get exactly what you want. Do you have a small number (or large group) of people that need camera training? Whether you're responsible for staff training or you're part of a group of friends clubbing together, get exactly the training you need. It can also be very cost effective, for example, to train a group of four people (on your own equipment) could cost around £125 per person per day. 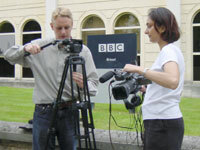 Previous clients include: The BBC; The Research Centre [Channel 4]; ITN Factual; Press association; NBC; Buckingham Palace Web office; Sony Computer Games; Oxford and Cambridge University and SSVC. Never had any formal training? Need specific help with your camera? Want to learn about white balance and exposure in more depth - rather than just leaving it in automatic. Not sure about crossing the line - or never heard of it ;-). Bought a new camera and finding the operating manual heavy going? Maybe you just have a whole heap of questions and need a bit of this-and-that. I can put together a training day to answer your camera and audio questions. The good news is that stills and video have a lot in common. Focus, F numbers, depth of field, shutter speed and good composition are almost exactly the same on video as they are with stills. Of course the big difference is you need to know how to shoot moving images that can be edited together and tell a story. I can also demystify audio and explain the types of mics available for different situations. Think of this as a conversion course.. Useful for beginners who have never used a camera and microphones before - or have had no formal training. Good for stills photographers converting to video and audio.We'll cover the technology - focus, white balance, exposure and audio. Plus, shooting for the edit, sequences and interviews. 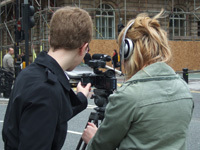 The course is aimed at journalists (print and broadcast), press photographers, those working in PR and anyone who wants to put short video clips on their website. Don't worry if you have never used a camera before. We cover all the technical aspects of the camera (manual focus, exposure and white balance). Plus, the different types of microphone and how to gather the best sound. You will also learn how to edit the sequences and interviews you'll have shot. Then call me on 020 8621 3649 or email me.